No, not the Bug Watch, just a bug you can watch. Does anybody know what this insect is? It is the second one of these we’ve found in our home in Western Australia. It’s very active and it smells horrible. In 25 years in Australia, I had never seen one of these until recently. Any ideas? We do have a similar looking critter here in Sydney and I think it is a form of mole cricket. Spends most of its life underground eating larvae, worms, grasses and software engineers. I believe they are found in a number of other countries and are an eastern Australian critter. If that is the case you may have a member of a forward invasion party, from the east, look for WestAustralian WMDs. Thanks, I think you’re right. One of my brother’s friends came up with the same answer last night. Next one we find is going to be sent to the museum. I just found one of these in my house and still have it. The way I found it was by having this brown liquid squirted on my foot. Anyone know of it doing this? Yes, they squirt smelly stuff out of their butts. I suggest you see if your local museum is interested in having it. I found one in New Farm (Brisbane) in around ’03. shot black goo about a foot… amazing insects. We called them mole crickets when I was a kid in Florida (USA). i recommend not to send it to museum (simply beacuse this cause the death of poor bug ) ..
we called it Dana Dişi ..
u can find images here, i post link because maybe u could not access Turkish letters şn ur computer.. Yes, we found one tonight in Balcatta WA 6021. We caught it in a see-through bugcatcher on a handle and it squirted goo onto the plastic, too. Sounds as if Western Australia has been invaded. We let it go hoping a wild bird will have a meal. We have seen one twice in the past week and a dead one about 3 months ago in our garage. This look like Gryllotalpa gryllotalpa(this is latin’s name). I live in Bibra Lake WA and have now found 4 of these bugs in the last couple of weeks… they sure do shoot black goo!! Have also found a big nest of babies… Does anyone know if they are harmful to people or the environment? 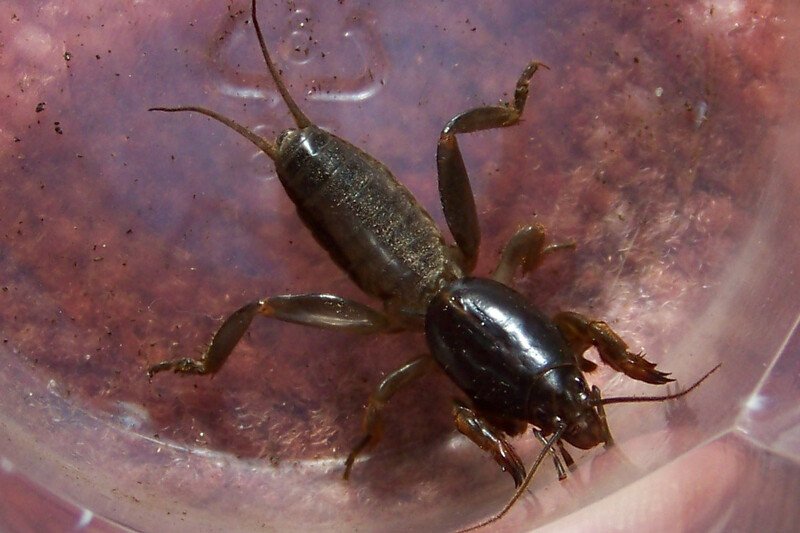 Lisa Mole crickets spends most of there life underground eating larvae, worms, grasses. So, depending on your point of view, their lifestyle is only a proplem to people or the enviroment if you don’t like the role for which (mother) nature created them. Live and let live; other than for we humans no animal, in its right place, ruins or damages its environment past the point of sustainabilty. i live in houston tx.. never seen this insects. but now i think i have an infestation. anyone knows how to get rid of them???? If you do have an infestation – not too likely – it is probably because their environment has been disturbed, dug up (by humans) etc. Learn to live with them and or give them a place to go and do their thing and they will surely leave you a alone. I have been in Perth all my life 36 years. I have come across these critters in the last couple of months and never seen them before. I killed the second one in a matter of weeks tonight in Yokine. They are extremely quick and quite resistant to normal fly spray.